Southern Front Door is your headquarters for amazing door finishes. The seven-step finishing procedure results in a door with a protective finish that ensures a long life and distinguished beauty. Southern Front Doors professionals apply only the highest quality stains and marine grade top coats. Southern Front Door Finish will hand sand each door after every step. The process assures an exquisite long-lasting protection. Inspecting & Hand Sanding – Every door and component is closely inspected prior to the finishing process to ensure quality. Then each door will be enduring a hand sanding process to ensure a perfect base upon which to begin the finishing process. 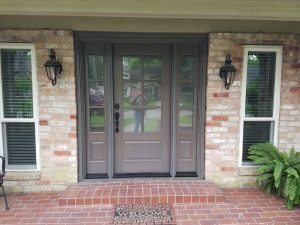 Staining the Door with a Stain – Choose from 22 stain colors! We only use stains made of oil, the pigments in the stain are resistant to fading and bleeding. Each stain remains on the door for the optimal period of time, to ensure the color penetrates deeply into the wood. First coat of a Marine Grade, Top Coat with Oil – After staining and drying, the door undergoes an inspection again. Sand is put on the first topcoat layer. Hand Sanding – After the first topcoat layer dries, the door is hit with another inspection. Then we do what we have to in order to make it professional. Second Coat of Marine Grade, Oil TopCoat – A second coat of marine grade is put on for that professional look. Hand Sanding – The final sanding step assures the beauty of the final product. Third and Final Coat of Marine Grade, Oil TopCoat – A heavy final coat is put on which will enhance the look. 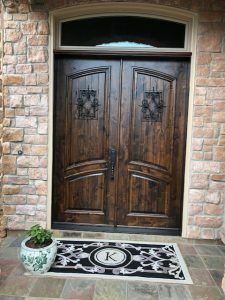 Make your front door personal because you walk in and out of it countless times a day. The look of your front door makes a statement to the neighbors but most of all, it will change how you feel about where you live. 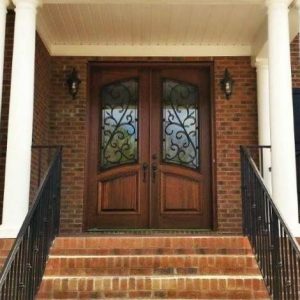 It might sound crazy but a Southern Front Door Finish will give your entire house a different look. Our goal is for you to feel amazing as you walk into your home. The goal is for you to feel successful. Southern Front Doors has an incredible showroom that you can take your time browsing around in. Once you decide on a door, we will have an installer come out to your home to take measurements. Installation happens at your convenience once the door arrives at Southern Front Door Finish by Southern Front Doors. Come to our showroom on the city’s north side, 11234 Jones Road West Suite B Houston, Tx. 77065 between 9 a.m. and 5 p.m. Monday through Saturday. Check out website out. You can also reach out to us 281-890-5860. Remember, reward yourself by walking through a beautiful iron front door by Southern Front Doors today!